Enterprise Mobile Network Operator, Geoverse, and RF Connect, a leading provider of mobility technology services, have partnered to streamline the design, network engineering, and deployment of communications solutions. By incorporating the Geoverse solution portfolio with RF Connect's existing ecosystem of LTE capabilities, the partners will deliver a flexible range of solutions combining commercial and private LTE. This flexibility will maximize the value of the CBRS spectrum to clients as its use cases expand and evolve going forward. It’s been years in the making, but in July 2018 the Federal Communications Commission (FCC) finally hit the final milestone to bring shared spectrum to the masses. The shared spectrum is known as Citizens Broadband Radio Service (CBRS). It has not received as much attention as 5G, but it’s an important development that will have a huge impact. One of the many applications of CBRS is solving the in-building cellular challenge. According to the U.S. Census, there are over 85 billion square feet of floor space across millions of commercial buildings in the United States. While mobile coverage in some of these indoor spaces is adequately served by “outside-in” coverage from outdoor cell towers, lack of seamless mobile coverage and poor user experience is unfortunately common in many buildings. This indoor challenge is exacerbated in modern "green" buildings that are designed and built using strategies aimed at improving performance. While good for the environment, the building materials used, often prevent outdoor cell signals from penetrating inside buildings. CBRS is important because it is designed to making Private LTE wireless networks economically and technically feasible for enterprises with performance significantly better than Wi-Fi used today for this purpose. 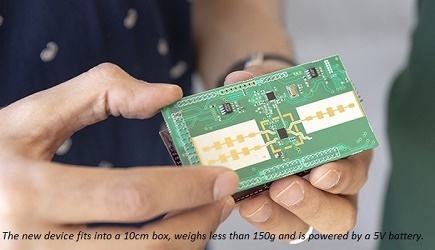 Also, Private LTE offers an alternative for IoT connectivity at the “long-range level” that is currently available almost exclusively by wireless carriers and operators of Low-Power Wide Area Networks. Wi-Fi is the technology currently used to create private networks. It is free from rules associated with licensed applications, and equipment is readily available, inexpensive, and reasonably easy to deploy. However, it also has significant disadvantages when compared to LTE wireless networks. Wi-Fi operates on unlicensed frequencies, along with Bluetooth, and other low-power communication technologies. Even though each one has a mechanism designed to keep it from interfering with others, so many are in operation almost everywhere that interference is virtually inevitable. Wi-Fi was also never intended to be used over more than small areas and has no "roaming" capabilities at its core. When compared to cellular standards, it is less spectrally efficient and requires several times the access points to cover a given area as well. Using CBRS, an enterprise can create a secure private LTE network to run corporate-level or site-specific applications, using custom applications on employee mobile devices. CBRS can also be used to provide in-building coverage for various facilities through a private network with enhanced security features, global asset tracking, virtual PBX solutions and much more. In short, it makes it possible to create an affordable LTE private network without having to rely on a wireless carrier, at much lower cost, with far less complexity. Consumers are shifting to mobile networks that are providing new, unlimited data bundles. That’s according to mobile network performance analyst OpenSignal. The testing-firm, which publishes an annual Wi-Fi-versus-mobile crowd sourced study, says consumers are taking advantage of unlimited data plans being offered by the major mobile network operators (MNOs) in the U.S. Meanwhile, with the exception of the most significant and most heavily frequented properties - where poor coverage can reflect upon the carrier brands - mobile network operators are no longer in the position to pay. Wireless connectivity, including 5-bar cellular coverage and capacity, is becoming an enterprise problem and CBRS may be the most cost-effective way forward. There is no lack of enthusiasm for Private LTE, and the CBRS Alliance created by Ericsson, Federated Wireless, Intel, Nokia, Qualcomm, and Ruckus Wireless, now has more than 120 members including all four major U.S. wireless carriers. In addition to being the umbrella evangelist for CBRS, the CBRS Alliance has established a product certification program in the U.S. to ensure multi-vendor interoperability and compliance with FCC rules. Every chip, technology OEM, mobile device and IoT supplier is now busy developing their ways- to-play with this can’t-miss new capability. Just like WiFi, the idea of using shared spectrum with low power access points will become a reality. LTE is no longer the private playground of large carriers. With the help from an experienced partner, like Geoverse and RF Connect, building owners, building mangers and enterprises can now unleash the high-capacity and lightning-fast indoor mobile service people have been are waiting for based on the new CBRS shared spectrum.